With Hollywood's celebrities preferring to attain 'nirvana' through Buddhism, the religion has achieved a glamorous status. 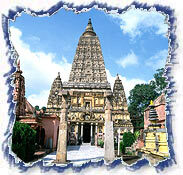 Bodhgaya is the place where prince Siddharata gained enlightenment, later to be known as Buddha, the enlightened one. 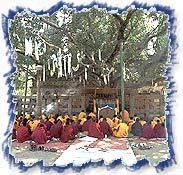 Bodhgaya seems to be completely steeped in Buddhist religion and culture. What more, there are monasteries representing all the Buddhist countries in the world. Countries like India, Nepal, Bangladesh, China, Japan, Burma, Tibet, Korea, Thailand, Sri Lanka and Bhutan have got monasteries built all over the place. Ritualistic prayers and penance are observed regularly and everyone is invited. Bodhgaya has a tropical climate. Summers are searing hot with temperature shooting up to a maximum of 48 degrees. Winter months (October- February) is the best time to a travel to this spiritual land. Light woollens during the winter are advisable. It is the Mahabodhi Temple that makes Bodhgaya a much sought-after destination for devotees, worshippers, travellers and tourists. The square-shaped basement of the temple measures 15 metres both in length and breadth, rising up to a height of 52 metres. The temple showcases a brilliant style of architecture. However, not much is known about it. Yet another travel attraction at Bodhgaya is the Archaeological Museum that houses a rich treasure of ancient coins, rare manuscripts and other items of the past. Besides the Mahabodhi Temple, to explore are numerous Buddhist monasteries and temples that are erected by countries like China, Japan, Burma, Sri Lanka, Tibet, India, Korea, Nepal, Bangladesh etc. Step into this unique world and travel this spiritual aspect of India. There is not a better place to attain peace of mind, body and spirit. This peepal tree is no less than a deity, specially to the Buddhists. This is the very tree that witnessed Buddha gaining enlightenment. Under this tree, Buddha meditated for seven days at a stretch. The present tree is the descendant of the original, it doesn't however diminish the grace and sanctity of the tree in the least. Apart from these, there are a number of other revered sites, associated to Buddha, like the Vajrasana, the Animeshlochana, the Lotus Tank, the Dharmachakra etc. Embark on your journey to this blessed land and appreciate the sanctity of the place. The Patna Airport (112 km) is the closest airport from Bodhgaya. Gaya, 16 km from Bodhgaya, is the nearest railhead. It is well connected by rail to almost all major cities of the country. By road too, Gaya has got good connections.